105 degrees. The weather app on my phone tells me how hot it feels outside, but I can feel it personally. I’m sweating while I type this column as I sit outside a coffee shop at 5:00 PM. Imagine what it would feel like to be a 300-pound, 15-year-old football player running up and down a football field wearing a full uniform, pads, and a helmet. For many Southerners, this is the best time of year. Summer marks the beginning of football season. On Friday, high school football players and coaches will arrive to grueling heat as practice begins. This year, they also arrive to fairly radical changes to the practice schedules because of the heat. As reported last week by Philip Bowman, the South Carolina High School League established rules for summer football practice designed to minimize the risks of heat illness to the young players. The guidelines, which were endorsed by the South Carolina Athletic Trainers Association, aim to acclimate players to extreme temperatures over the first two weeks of practice. In the first two days, teams may practice 3 hours in helmets and shorts. For the next two days, they can practice in helmets and shoulder pads and use sleds and dummies. On day 5, teams may engage in full contact for three hours in full gear. On days 6-14 of summer practice, teams must alternate between long days (5 hours) and short days (3 hours). Coaches can divide the times of practice but must separate the sessions by two hours of continuous rest. Scrimmages count as 3 hours, regardless of whether they are held on long or short days. Walkthroughs are allowed and do not take away from practice time, provided that the teams perform them indoors in cool conditions. A 2008 study by the National Center for Catastrophic Sports Injury Research reported that 33 football players died of heat stroke between 1995 and 2008, with 25 of them occurring at the high school level. But it is important to look at all heat illness in sports and not just deaths from it. In the July 29, 2011 Morbidity and Mortality Weekly Report, The Centers for Disease Control and Prevention (CDC) estimated that 5,946 persons are treated in U.S. emergency departments each year for a heat illness suffered while participating in a sport or recreational activity. Males, especially those 15-19 years of age, make up the highest demographic of heat illness victims. Not surprisingly, football accounts for the majority of those heat illness emergency visits. About 7% of victims required hospitalization. While heat illness is scary and deaths from it are tragic, we can take some relief knowing that it is a preventable problem. 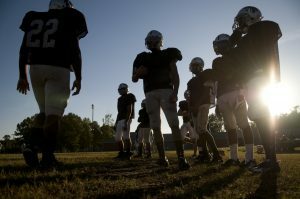 A large percentage of the heat-related deaths in high school football occur in the first two weeks of summer practice. Acclimatization, or the process of getting the body ready for activity in hot conditions, has been shown to be a key factor in preventing heat illness. These guidelines aim to get young athletes ready for the tremendous heat they will face in summer practice. Start activity with less equipment that traps body heat. Slowly add in equipment several days later but alternate short and long days to allow bodies to recuperate. Similar policies, which reflect position stands of the National Athletic Trainers Association, the American College of Sports Medicine, and the American Academy of Pediatrics, have already, or will likely soon be adopted across the country. The real value comes from taking judgment somewhat out of the picture. Sure, every football coach cares about the health and safety of his players. But the pressure to win, especially in football in the South, is enormous. These rules might eliminate the temptation to run a few more drills or make kids come back for an extra practice later in the day. We also cannot depend on players to tell coaches and trainers when they are overheated. Young athletes don’t want to let their teammates down or cause their coaches to think they are weak. Even at the professional level, players minimize or deny symptoms to stay in the game. Brian Urlacher and Troy Polamalu recently made headlines admitting the common practice of lying about concussions to team doctors. And while athletic trainers are critical for evaluating players for heat illness and initiating treatment, they have to closely monitor 80-100 players. By the time dizziness, nausea, and disorientation develop, rest and water are not nearly enough to help these kids. Hopefully the new South Carolina rules will keep players from ever reaching this condition. I completely expect some former athletes to dismiss my public approval of the new policies. Sports medicine physicians have grown accustomed to claims that such changes in sports “make kids soft.” But we aren’t trying to water down sports or weaken or soften young kids. We want to keep them alive and healthy enough to play. What do you think of the new practice rules? Are they enough? Do they go too far? What else can we do to prevent heat illness? Note: The following post appears in a modified form as my sports medicine column in the July 26, 2012 issue of The Post and Courier. I want your Olympics sports medicine topic ideas!